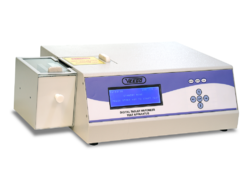 Pioneers in the industry, we offer precision dial type tablet hardness tester and veego digital tablet hardness tester from India. We are a leading manufacturer ofPrecision Dial Type Tablet Hardness Tester. Measures the force required to break a tablet by a diametric compression test. 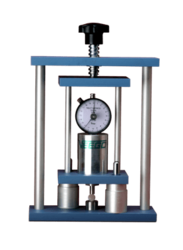 It is a vertical loading mechanical strength testing machine. Force is required to break the tablet gets measured by a Dial Gauge. It can either be fixed on a bench or placed on any smooth surface. 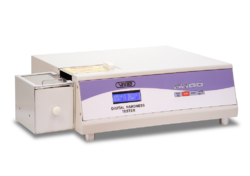 We are a leading manufacturer ofVeego Digital Tablet Hardness Tester. Equipped with microcontroller based circuitry, specially designed to measure Hardness, Diameter and Thickness of the tablets. Measuring units for Thickness and Diameter mm (Millimeter) or IN (Inches) hardness selectable in either Newton (N), kilopond (kp) or Kilogram (Kg). Provides connectivity to balance via RS 232 interface. Password protection for secured data storage. Keyboard Inputs Tactile + QWERTY. Micro-controller based circuitry to measure the hardness of tablet. 2 line LCD display panel. Serial port connectivity for printer interface. Easy calibration and validation mode for hardness. Looking for TABLET HARDNESS TESTER ?